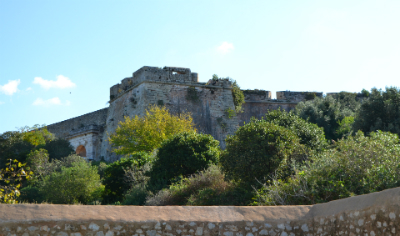 Niokastro was built by the Turks in 1573 and consisted of two large rectangular batteries dominating the entrance to the harbour which may be earlier than the hexagonal bastioned 'citadel' on the top of the hill. Between these was laid out a small walled town with a central mosque. 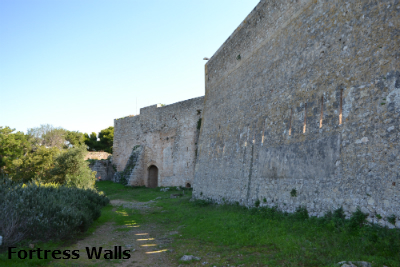 In 1686 the fortification was captured by the Venetians under Francesco Morosini after a 12 day siege. During the course of this operation the powder magazine exploded destroying the north bastion of the citadel. In 1715 Turkish rule was restored and the Venetian forces driven out. The declaration of war on the Ottoman Empire in 1770 by Russia saw an attack on defences in the area by a small Russian force working together with local Greek forces. Niocastro surrendered after a six day bombardment. However, following the arrival of an Ottoman army consisting of several thousand Albanians the Russians in turn withdrew. At the beginning of the Greek War of Independence (1821), Niokastro was besieged and surrendered to the Greeks. Despite the tenacious resistance put forth by the Greeks who fought from Niokastro, Paleokastro and the island of Sphakteria, Ibrahim Pasha and his Turkish-Egyptian army occupied the area in 1825. The gulf of Navarino was the theatre of the most momentous naval battle of the Greek War that took place on the 8th of October 1827, when the fleet of the three Allied Forces, England, France and Russia, annihilates the Turkish fleet. 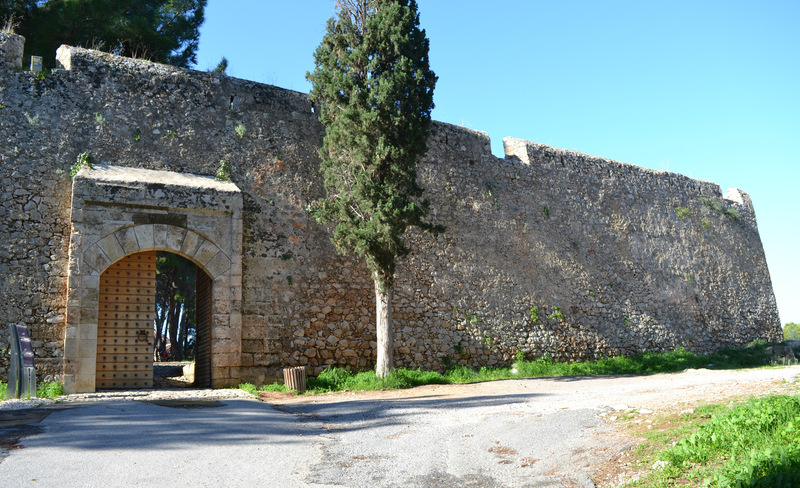 Yet, Ibrahim Pasha remains in Niokastro until September 1828, when he finally surrenders the fortress to a Fresh expeditionary force under general Maison. The citadel lies at the summit of the hill occupied by the fortress. It is a hexagonal enclosure reinforced by pentagonal bastions at the corners. The walls are strong and low, with one line of fire at their summit, where the wide corridor for the circulation of cannons is supported on a series of ground level arches. The bastions have vaulted chambers at ground level with terraces above. The citadel belongs to the initial building phase of the fortress however its present state is owed to the Venetians 1686-1714, the French expeditionary force 1828-1833. 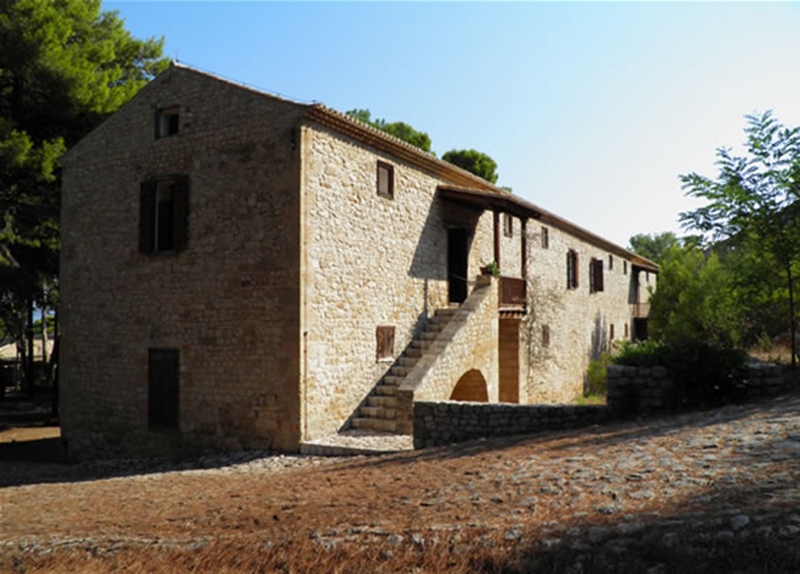 During the Second World War it was used as the headquarters of the Italians and, later, the German forces. The enclosure of the city forms an irregular pentagon. 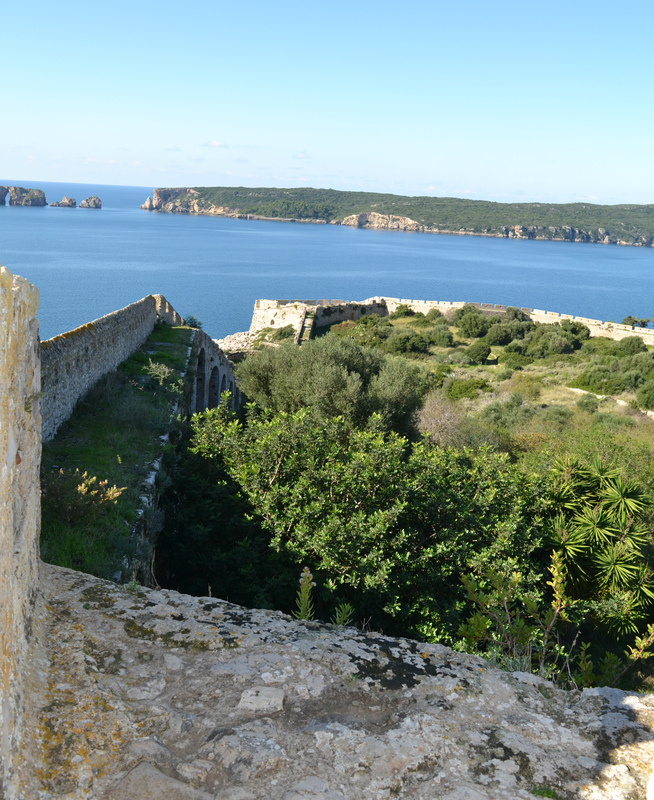 The walls are relatively weak while a narrow wall-walk with battlements and gun loops occupies the summit. The south side, known as the Megali Verga, is characteristic due to the wall-walk that rests on a series of semicircular arches. The enclosure is reinforced by two rectangular bastions, two semicircular bastions and two smaller circular towers, built regular intervals so as to flank the walls. Two rectangular bastions protect the south entrance to the gulf and the harbour of Navarino. They have a great firepower, with cannons set at superimposed levels. Multiple construction phases are discerned, an indication of a constant effort to reinforce their capacity. 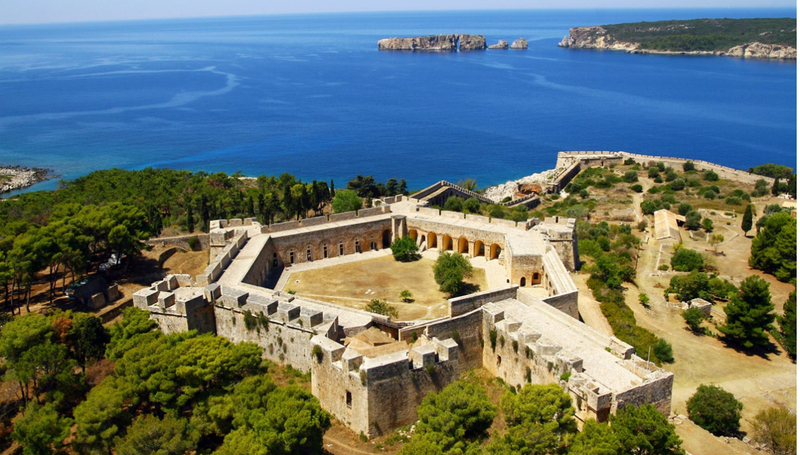 In the second half of the 20th century the northern one is used as the gymnasium of the Pylos School, while the area between the bastions serves as the city's football ground. 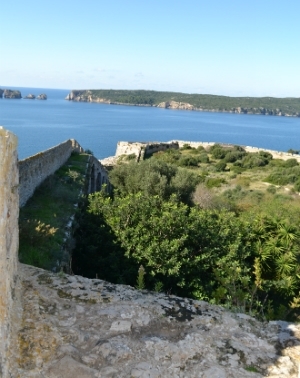 The city within the walls followed the construction of the Fortress in 1573. An Ottoman traveler of the 17th century recorded six hundred houses, eighty-five shops, two mosques, an inn and a bath. In 1821 the Muslim population evacuates the settlement, which becomes totally deserted by 1828. 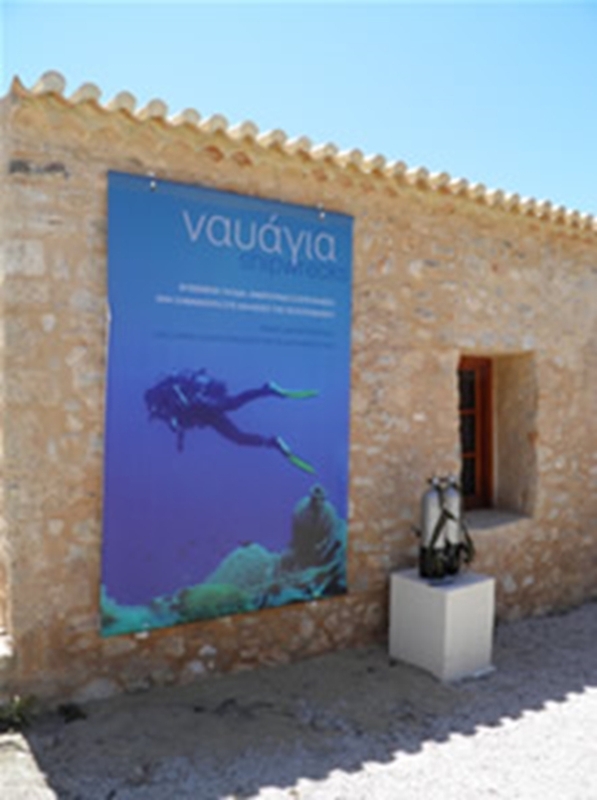 A major programme of restoration and rebuilding was carried out between 1985 and 1987 opening part of the barracks as an art gallery and setting aside other areas for the Greek Centre for Underwater Archaeology. 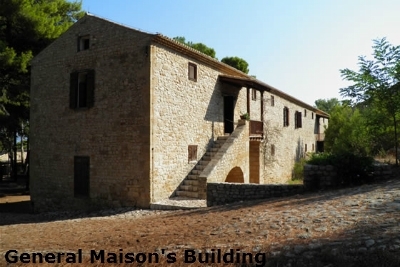 General Maison's building is a rectangular, two-storeyed stone building erected in the 19th century has been reconstructed and now houses the Museum and the offices. The walls of the Acropolis are very thick and display an inward inclinination to make enemy missiles bounce off without damaging the fortress. 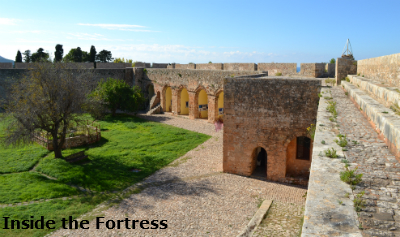 The shape and dimensions of the bastions are defined by mathematical calculations, in order to accomplish maximum benefit from the firearms of the castle and comprise an organic element of the fortress layout. For their construction, limestone was used for the external facades, while the inte-rior was constructed with rubble and large bricks. In the perimeter of the fortress, there are six frustum (truncated cone) shaped bastions, four of circular layout, one of which is Makrigiannis bastion. The other two are of rectangular layout. The Church of the Metamorphosis (Transfiguration) is a cross in square domed church dedicated to the Transfiguration of Christ. It was used as a Moslem mosque and was later converted into a Christian church, seemingly it has changed back and forth no less than 7 times. The project "Rehabilitation of the Church of Transfiguration of the Saviour" was financed by Greece and the European Union and the budget was 1,400,000 euros and lasted for 60.5 months. The project started in the second half of 2011 and was completed in the second half of 2015. 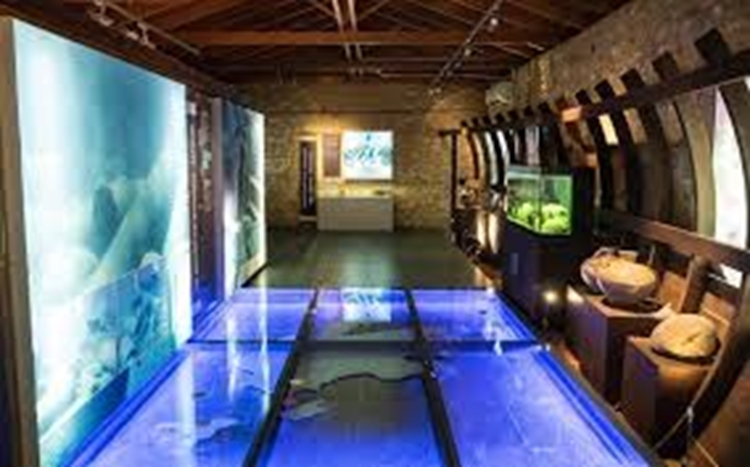 The Ephorate of Underwater Antiquities opened an exhibition in Niokastro in 2012 and represent the only place in the country where you can get a comprehensive view of Greece's underwater treasures. 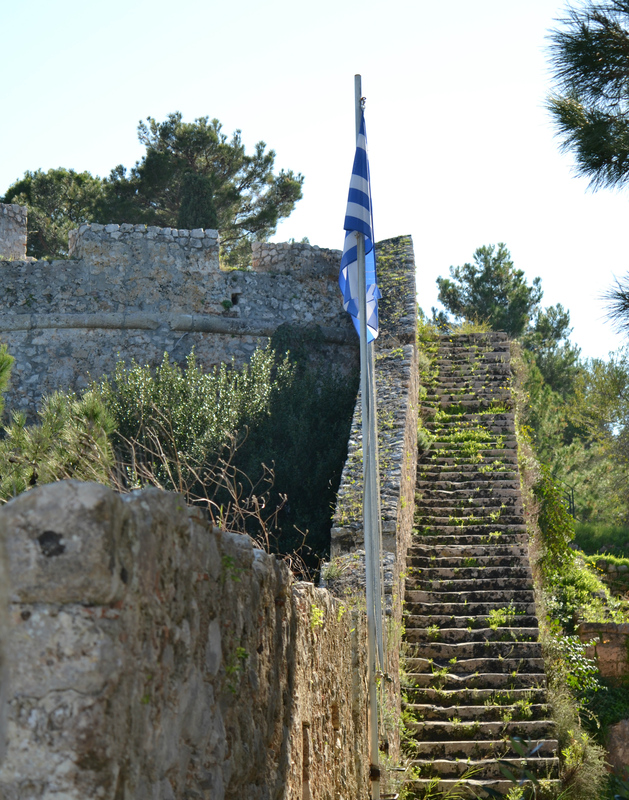 Restoration and remodeling work has been carried out on the castle's Makriyianni Rampart and Pasha Building, which today are among the structures used to showcase the work being done by the Athens-based ephorate. In the main hall of the Pasha Building, which has been designed to resemble an ancient ship hull, a huge map of the Peloponnese on the floor helps visitors locate the show's seven wrecks, which lie off the shores of Cephalonia, Zakynthos, Kythera and Methoni and date from the prehistoric to modern times. 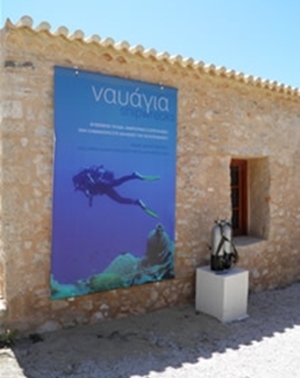 They include the shipwreck off Cape Xi in Lixouri, Cephalonia, with its impressive Hellenistic-era statues. The sculptures were likely stolen from a Greek temple and loaded onto a ship that was sailing to Italy when it sank. There is a compass and stone plaques adorned with fossils of fish. These came from the Mentor, the ship laden with sculptures taken from the Parthenon on the orders of Lord Elgin, which sank off southern Kythera en route to England. 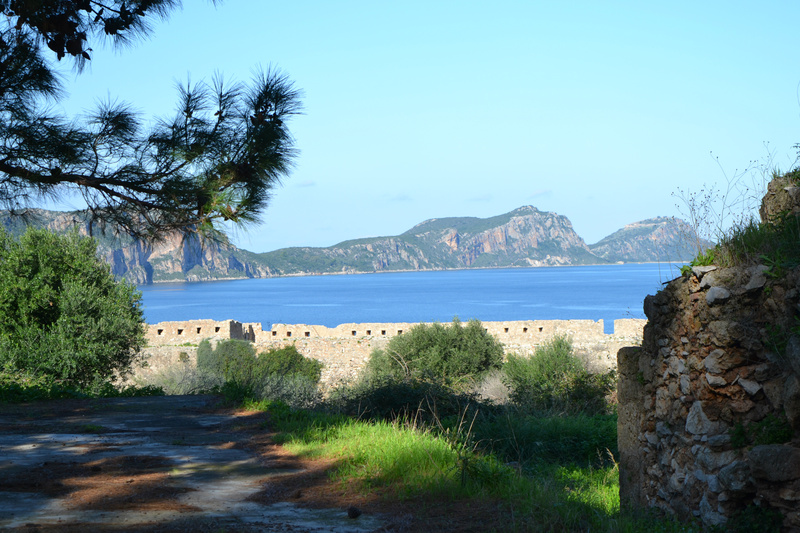 As you drive on the road from Pylos to Methoni leaving behind Navarino Bay, you shall see the Kamares on your right. The Kamares were part of the old aqueduct which provided Niokastro with fresh water. The aqueduct of Navarino is a remarkable late medieval project that is characterized by numerous building phases. 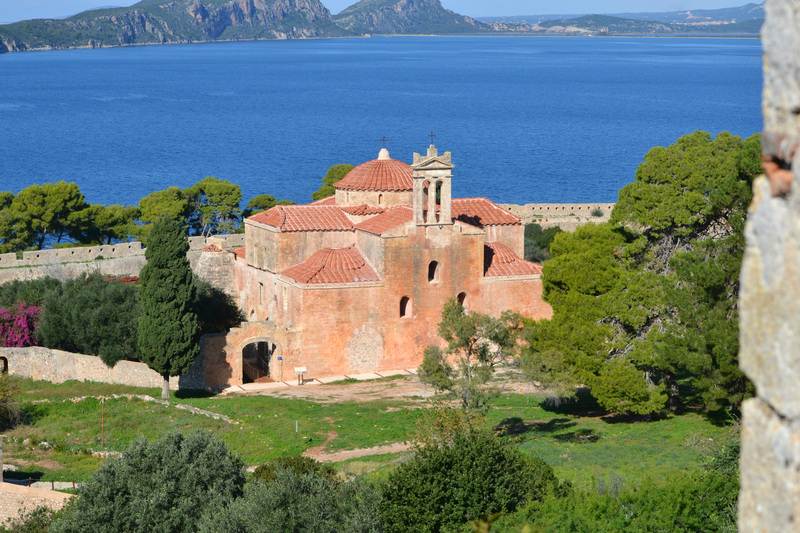 Its construction covered a period from the 1st Ottoman rule through the 2nd Venetian rule of the region and several repairs on it took place during the first years of the Hellenic State. 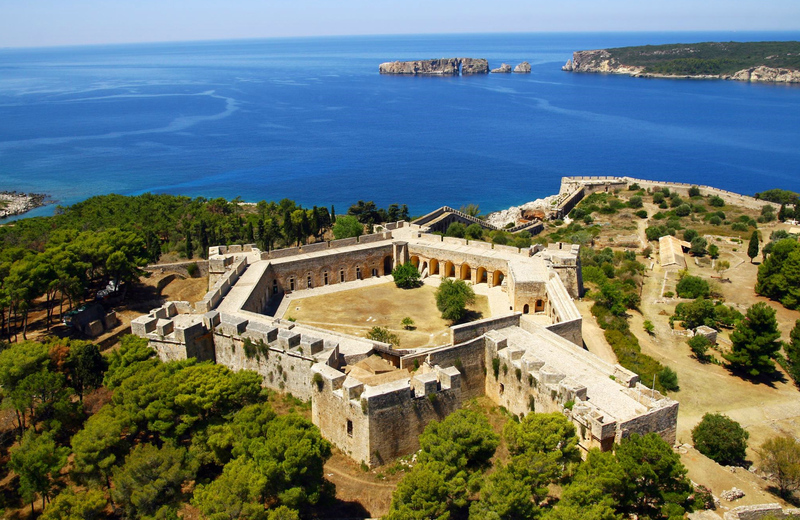 It fulfilled the watering demands of the New Castle (Niokastro) and later on of the whole small town of Pylos until the beginning of 20th century. 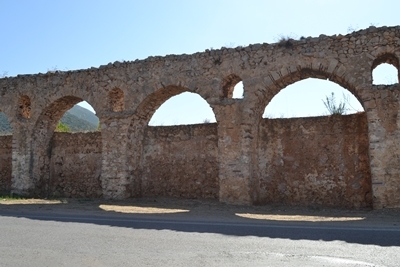 The aqueduct consisted of two distinct branches which supplied water from two different springs. The older part carried water from the nearby spring of Palionero (old water) 4km away and the newer from the Chandrinos area covering a distance of approximately 12 km. In comparison to the older short branch which had mainly a conduit on the top of a thick wall, the later one incorporated numerous arched sections and impressive, for that region, aqueduct bridges, as well as on ground and underground covered conduits. 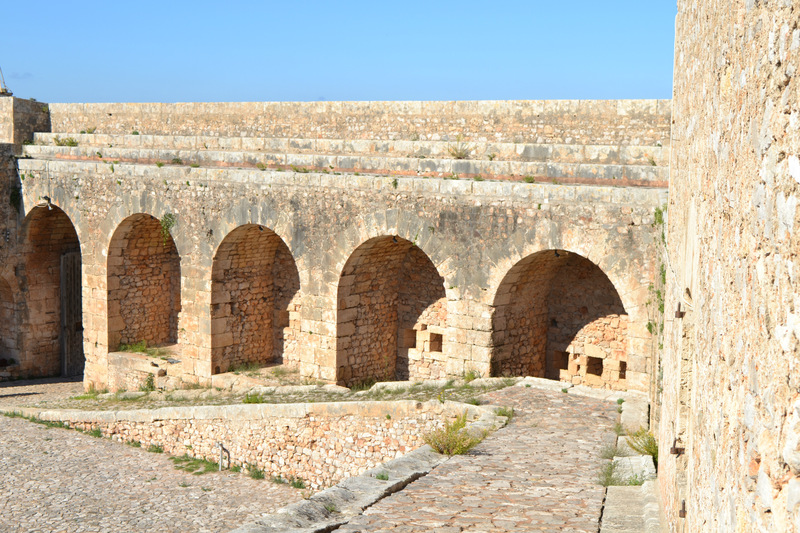 It was likely that the water supply of the fortified enclosure was critical for its survival, since there was no spring water inside the castle, and the aqueduct supplied the essential water. 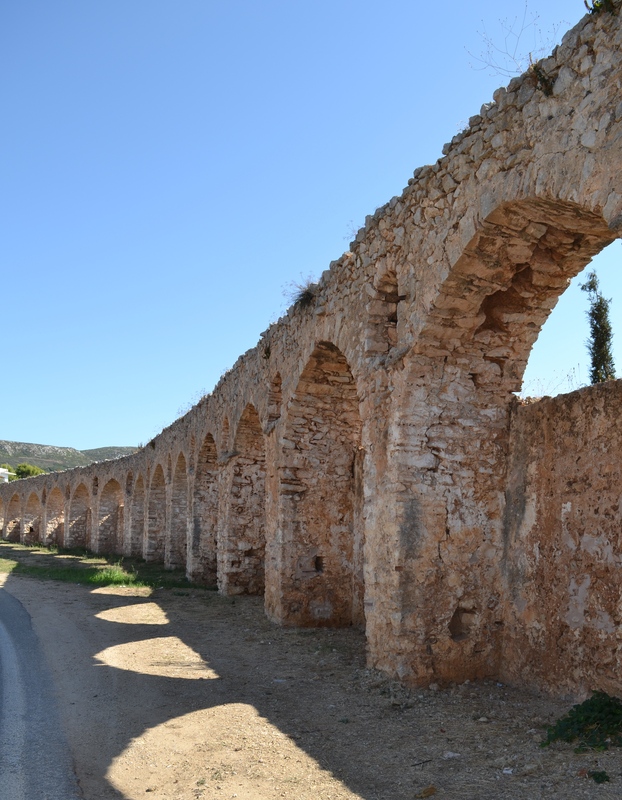 A Research Project of the Architectural Department of the University of Patras that was carried out in 2008 was a recording and restoration study for the arched part of the aqueduct which is situated near Niokastro on the southern outskirts of Pylos. Despite the specific subject of the study, the whole path of the aqueduct was traced up to its springs near Chandrinos. 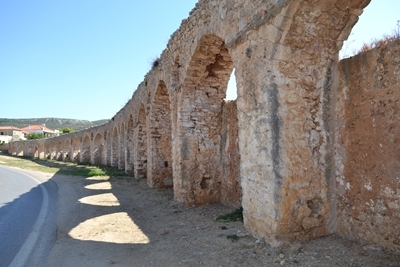 The older aqueduct from Palionero consisted of a simple stonewall of minimum width of 0.60m. The spring is located SSE of the Castle. On the top of that wall the conduit was originally formed by a strong mortar layer. Later interventions, repairs and additions embodied a tile bottom or a clay pipe. At Kamares (arches) it was partially overlapped or adjoined by the arched sector of the aqueduct from Chandrinos. The coverage of the higher conduit testifies the simultaneous operation of both aqueducts. 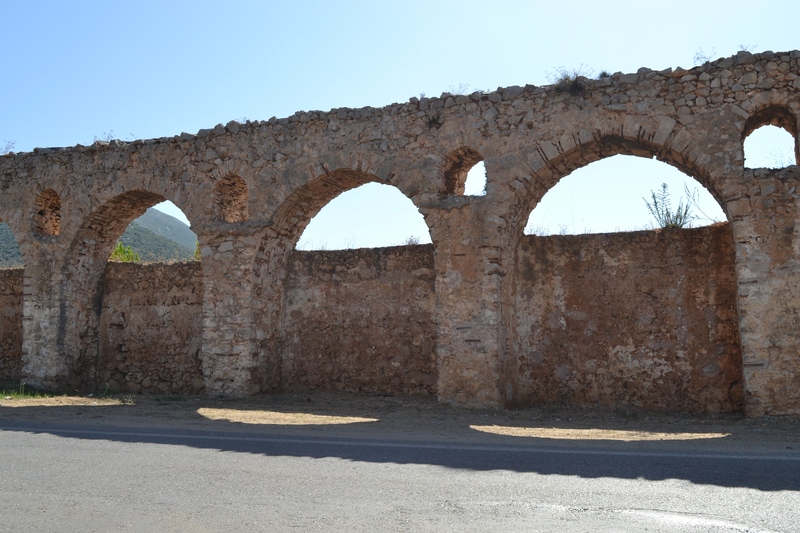 It is not known how the path of this aqueduct continued after the building of the newer arches since the repairs of 1830's dealt only with the newer remains and the older ones were probably demolished. 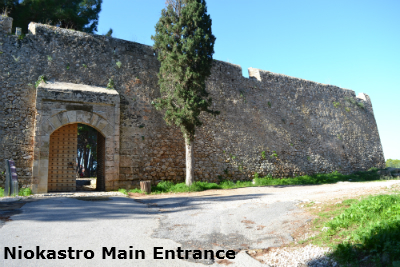 The last part of the aqueduct was underground passing under the protruding low bastions of the spalto and ended in the castle at two positions, one at the acropolis and the other next to the main gate. There, it fed cisterns and the shrines-fountain. It is evident that the project for the water supply of Niokastro incorporated most of the relevant technology of the Ottoman builders of that era. Large salt accumulations at the water bridges, testifies neglect and lack of maintenance for decades. 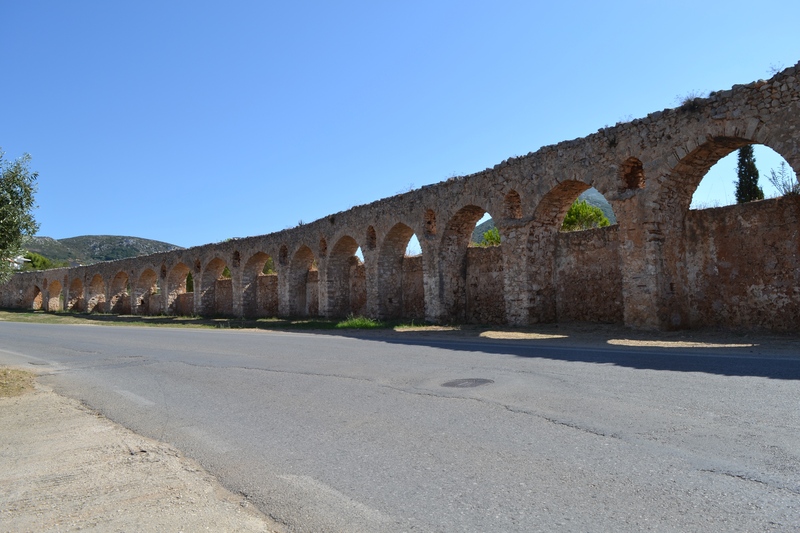 Despite the above points, the aqueduct managed to provide Niokastro with adequate water quantities from a spring situated more than 12 km away, crossing a rough mountainous terrain, for a period of 250 years. In addition, it preserved the continuation of the usage of the pre-existing construction that was supplying water from the Palionero springs. 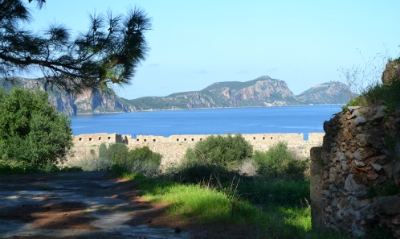 Finally, parts of the original structures at the site of the spring repaired and modified by the municipality of Pylos, are still in use due to their sound construction!